A module on integrated circuit design is included to provide the analyst with an overview of basic design techniques. Many analysts come to the failure analysis laboratory with a device physics or materials background rather than a design background. The material is designed to give the analyst a moderate level of detail in basic design principles, memory design, microprocessor design, and analog circuit design. Basic structures (functional blocks) are explained to give the analyst an understanding of how the circuitry functions. A basic understanding of integrated circuit design can help the analyst more quickly understand electrical signals and data associated with failing ICs. 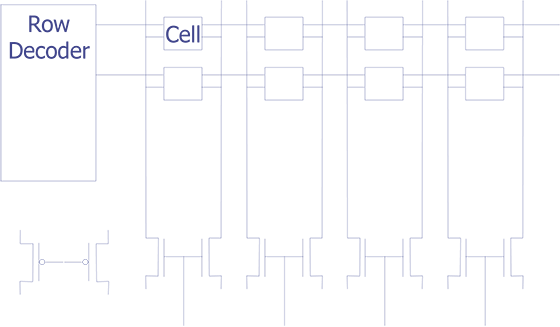 Because the majority of today's integrated circuits are manufactured using CMOS technology, the bulk of this section will discuss VLSI design from a CMOS perspective. Let's begin with some basic ideas. Functions implemented in CMOS contain a PMOS network and an NMOS network (see Figure 1). 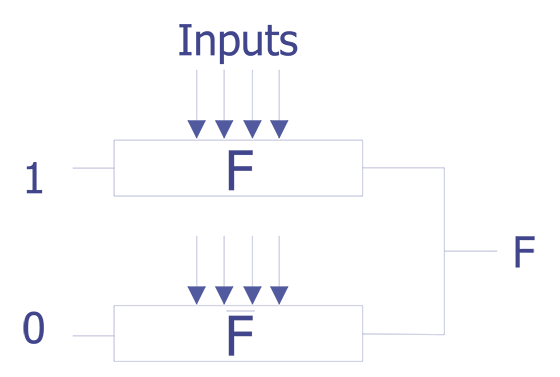 When the NMOS network is on, for example, conducting current, the PMOS netowrk is off. Likewise when the PMOS netowrk is on, the NMOS network is off. 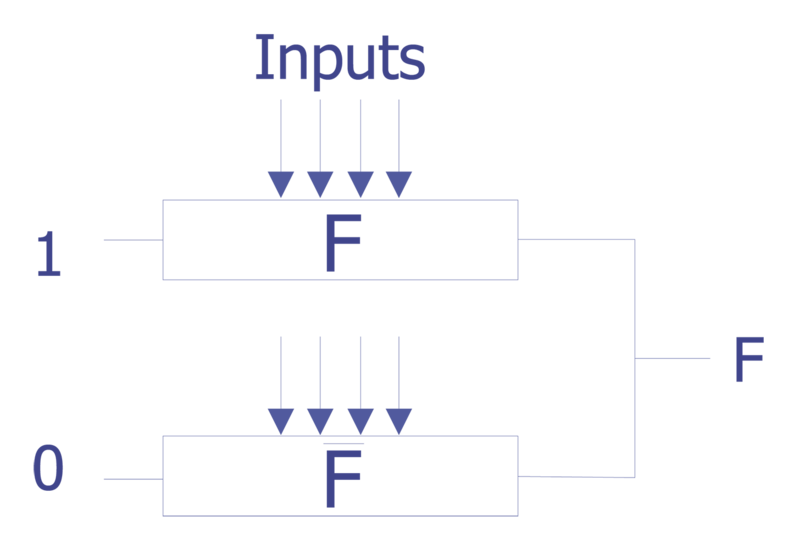 If the two networks are designed such the PMOS and NMOS networks are on simultaneously, the output F will be determined by the drive capability of the two networks rather than the input parameters. Furthermore, the circuit will conduct a relatively large amount of current, negating one major advantage of CMOS technology - low current draw. 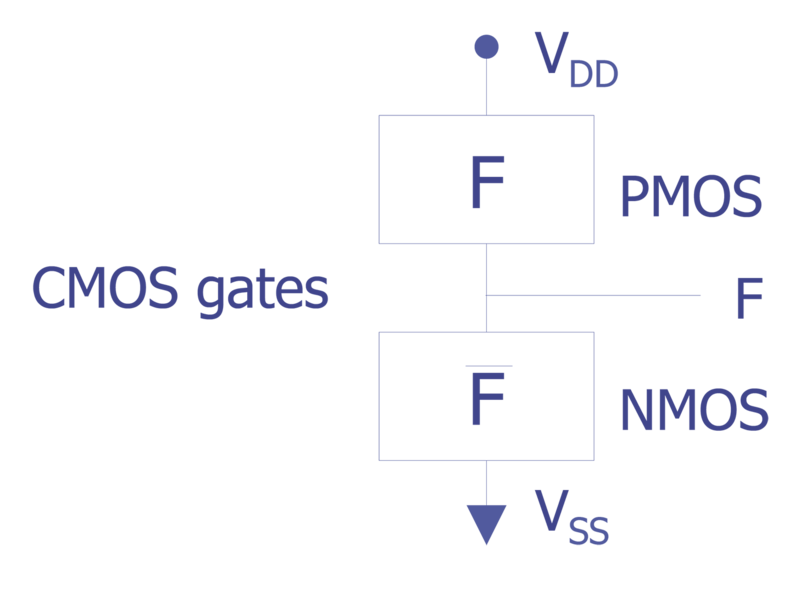 Basic concept showing the PMOS and NMOS networks in a complex CMOS logic gate. 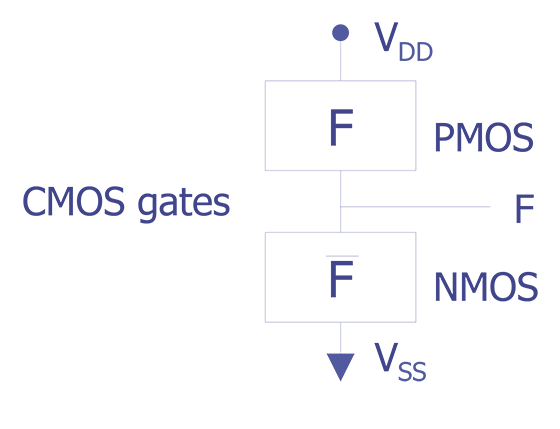 The PMOS and NMOS network share a concept known as duality. Duality can be thought of as the inverse of the original. Consider the folowing example: let's assume the function F is the function of four variables, A, B, C, and D. Now, if F = AB + CD then F = AB + CD = (A + B)(C + D). This can be shown schematically as shown below in Figure 2. 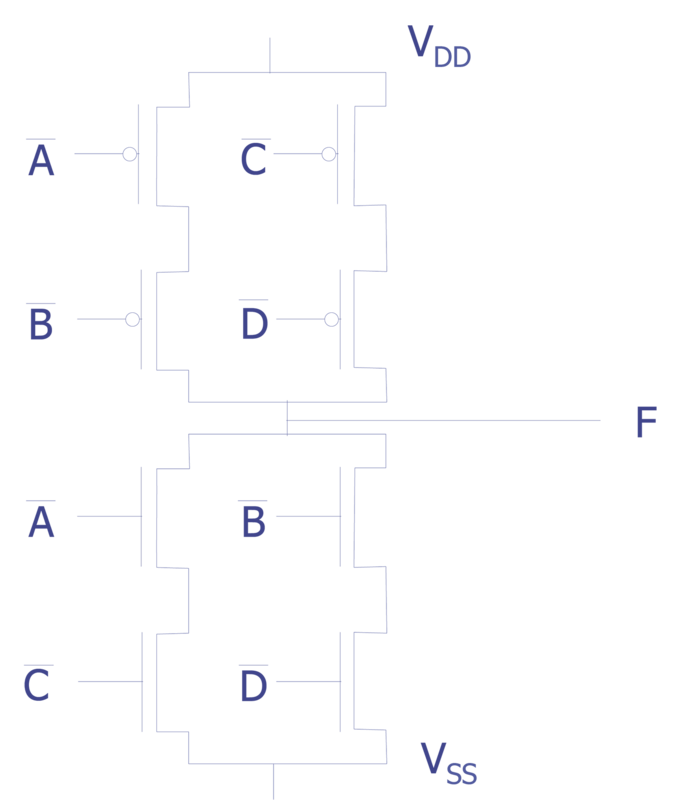 CMOS circuit function showing the concept of duality. The pass transistor is similar to the standard gate structure (see Figure 3), except the sources of the networks are connected to previous gates rather than being tied to VDD or VSS. 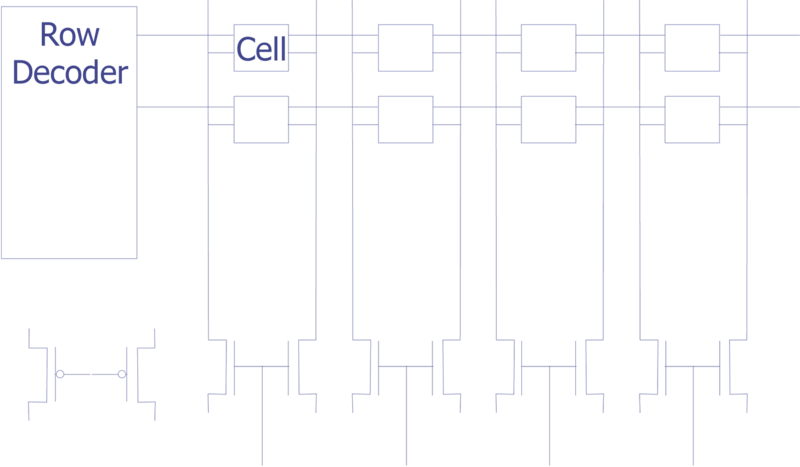 Basic concept showing pass transistor structures. This section is divided into 3 sections: Random Access Memory Design (Static and Dynamic), Read Only Memory Design, and Floating Gate Technologies (NVRAM, EEPROM, etc.). Random Access Memories or RAMs are commonly used to store program and data contents. RAMs have the following organization (see Figure 9). There are several variants of Random Access Memories: dyanamic memories and static memories. Dynamic Random Access Memories (DRAMs) are typically the largest (in terms of bits of storage). DRAMs use a single transistor as the switch and a capacitor to store the charge. DRAMs must be refreshed during the read operation in order to maintain the charge on the capacitor, hence the term dynamic random access memory. 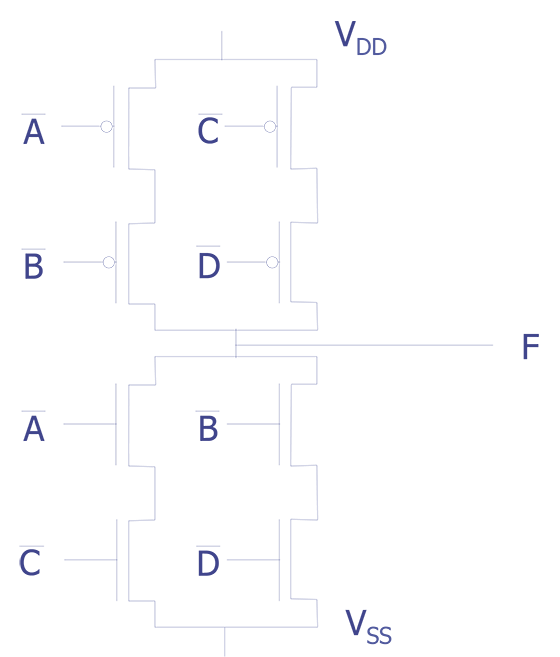 The schematic of a conventional DRAM is shown in Figure 10. DRAMs are designed with either stacked capacitors (capacitors that are formed in the layers above the silicon), or trench capacitors (capacitors that are formed as a trench down in the silicon). Schematic of a dynamic random access memory cell and its operation (after Singh). We are currently working to upload content to this section.